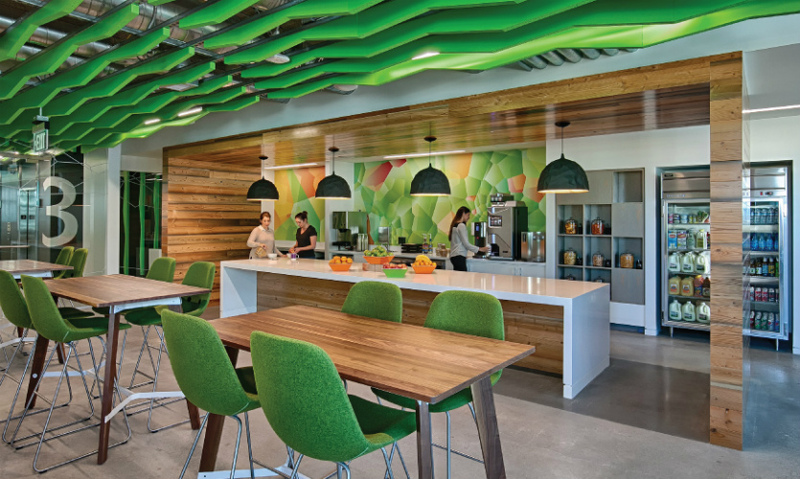 When Google opened its new Tech Corners Campus in Sunnyvale, California, they were committed to creating work and social spaces that support employee health, enhance the workplace experience and improve overall sustainability. With these goals in mind, Valerio Dewalt Train Associates and Media Objectives established guiding design principles aimed at creating a place that inspires the growth of the Google community, a surprising design filled with the unexpected, an idea that has big buzz but is economical, a campus concept that is scalable and a place that is memorable. Like many of its tech counterparts, Google is not the same scrappy start-up it was almost two decades ago. 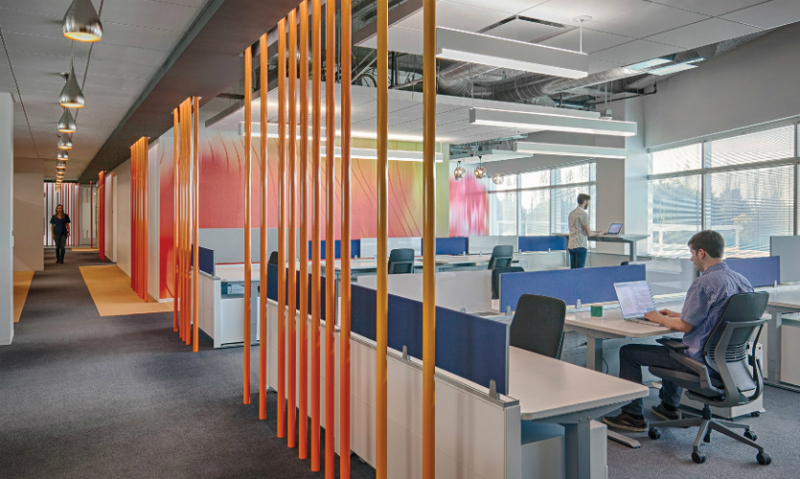 It’s growing up—and its workspaces are constantly evolving to reflect the maturing brand. 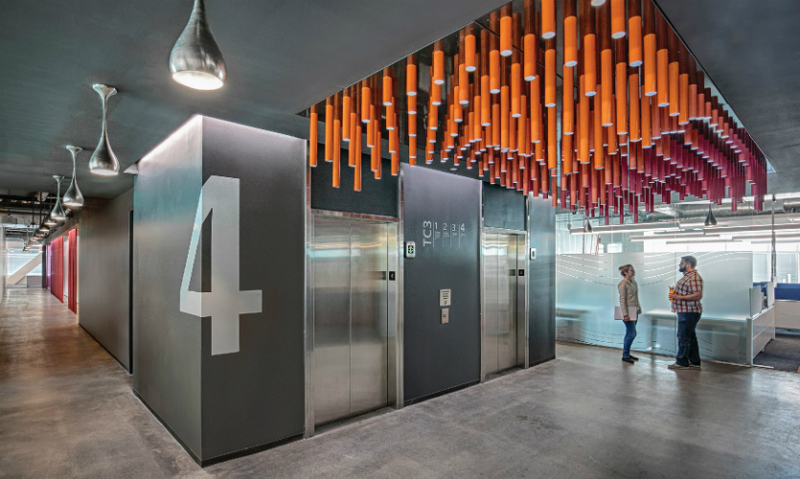 So when M-O set out to create a new wayfinding, signage and graphics program for the campus, it wanted to infuse the environment with playfulness and ambiguity, sophistication and environmental consciousness. The result is a new take on the iconic brand. The “playful” part is evident right away, in the primary sign identifying the Tech Corners Campus. M-O treated the ubiquitous Google logo by splicing it in half and cutting the remainder of the colorful letters out of the top of the sign. The logo is absent from other monument signs, a clever take on a brand that publicly embraces creative interpretations of its identity. 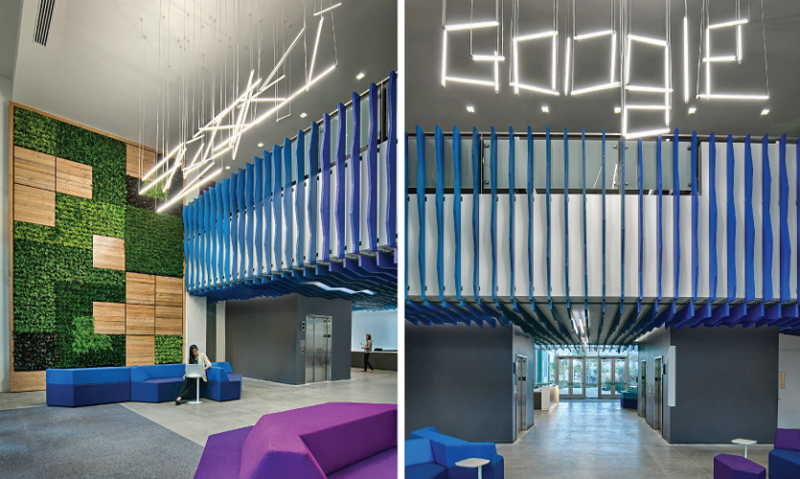 In another visual wink, the Google logo is replaced by its almost-as-iconic pin-drop symbol cut from the pylons. 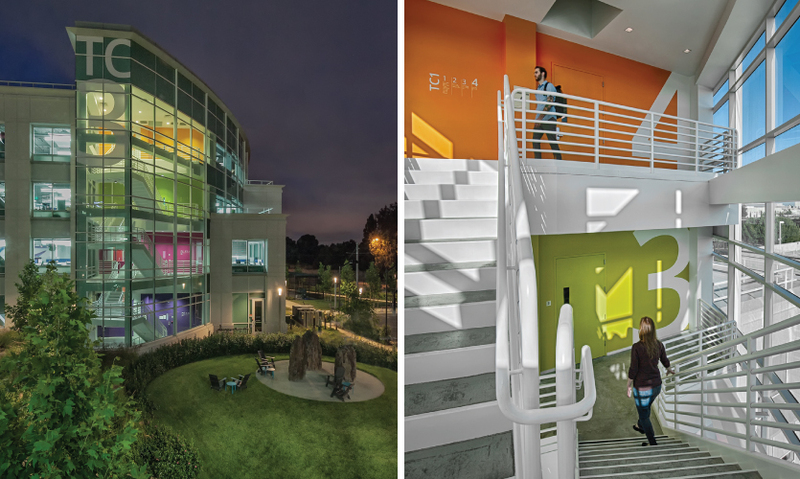 Strategically placed pedestrian wayfinding guides employees and visitors through the campus. 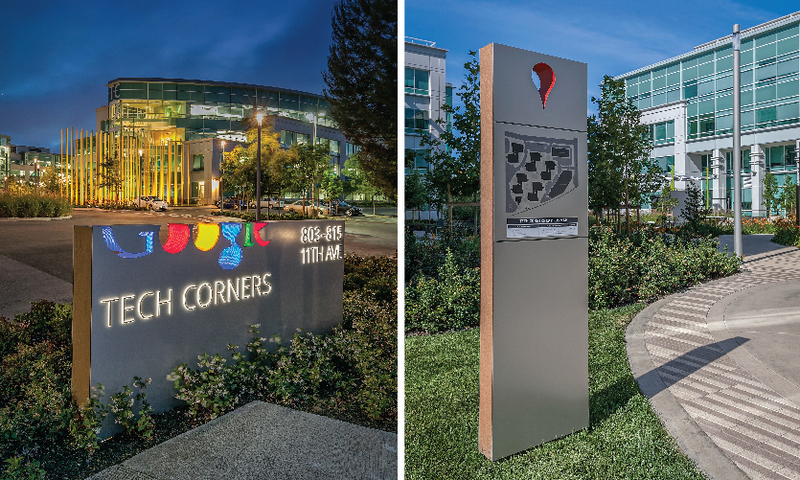 The exterior signage program includes three monument signs, 11 pedestrian site maps and 11 building identification signs. 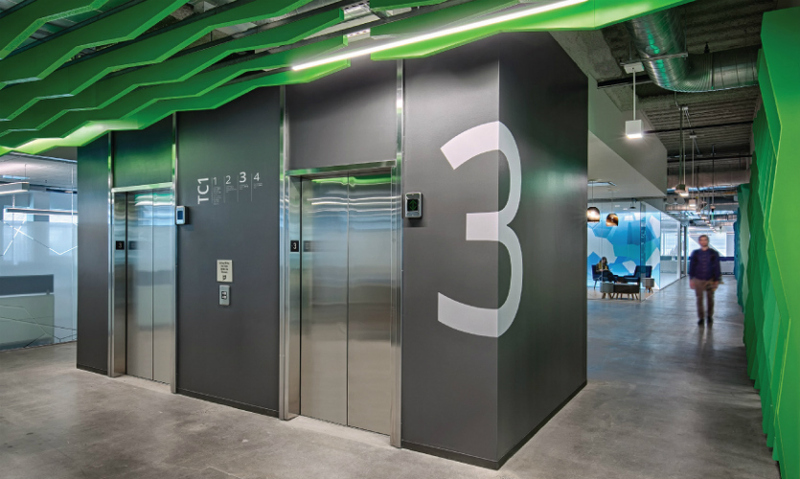 Inside, the project includes 10 “mega-sized” graphics in stairwells, 86 building directories and over 200 custom large-format graphic prints. Individual directories guide visitors through each floor by reinforcing key rooms and amenities located throughout campus. 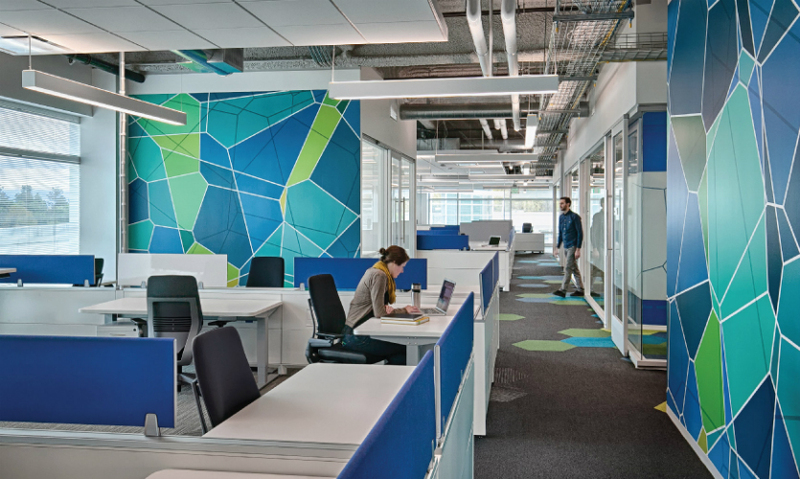 Overall design strategy was developed in tandem between the integrated brand design (Media Objectives) and architectural (Valerio Dewalt Train) teams, breaking down the barriers of design roles to produce a holistic experience that integrates spatial planning and graphics seamlessly. Reviews on the new campus are great. 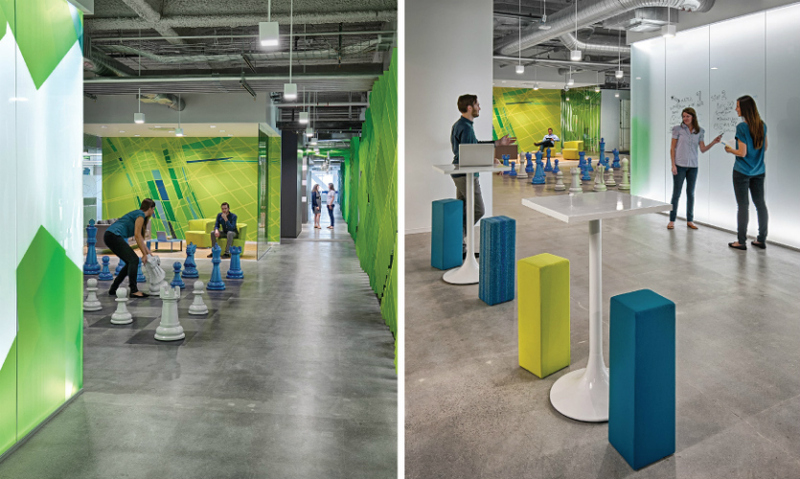 Tech Corners is regarded as one of Google’s most innovative and sophisticated campus to date. Employee response has been overwhelmingly positive through direct and social media feedback, says Spurlock. Look for more content in Wayfinding and other areas of interest in SEGD's Xplore Experiential Graphic Designindex! Want more on Wayfinding? SEGD's 2016 Wayfinding eventis April 14-15 in Miami!